This beach pillow is so cute and would look perfect as a decoration in a beach house or any room that needs a bit of coastal charm! 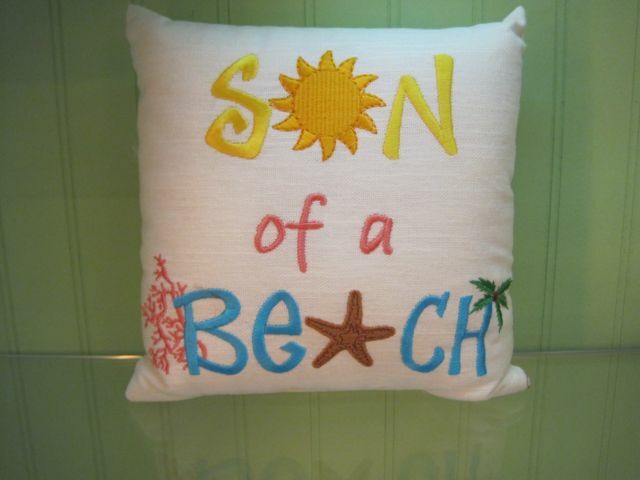 It is a small, square and white pillow that has “Son of a Beach” embroidered in colorful letters (turquoise, yellow, orange)! The pillow measures a 9 x 9 square. 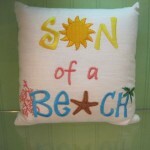 It is also embellished with a sun in the word “Son” and “Beach” is decorated with coral, a starfish, and a palm tree. This would be perfect as a gift or a great accent to add a little bit of the shore to your home!